During the first year of their studies our students undertake two different company-led design projects. These are self-contained small R&D projects that are carried out for about 10-12 weeks. Working in teams of 3 or 4 our students liaise with companies as if they were their consultants and work closely with them to a set of milestones and deliverables. You can read about the group projects that was set by Siemens on the Heriot Watt University Website. This is a good platform to test-drive some concepts that you might want to explore. If you have a project idea in mind, get in touch with our Centre Manager Donna Palmer. 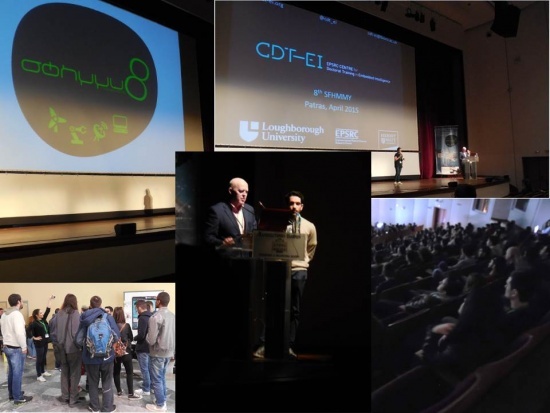 As part of our CDT programme we run a fortnightly series of seminars (or webinars) delivered by esteemed members of the international scientific community or industrialists, working at the forefront of research and industrial best practice that underpin applications of embedded intelligence. This module has specifically been created to inspire and encourage our PhD students, keeping them aware of state-of-the art technology, and seeding further discussions and ideas. 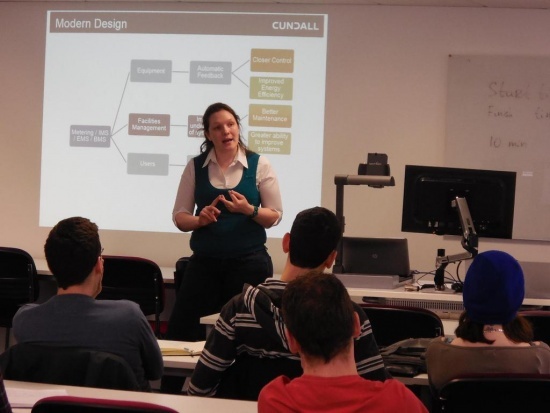 One of our recent speakers was Chloe Agg, a Senior Mechanical Engineer at Cundall. Chloe has prepared a blog post about her experience with us and it can read here. The CDT team embarked on the 2015 recruitment roadshow earlier this month. The roadshow kicked off in Greece visiting the National Technical University of Athens. Our CDT Director Prof Paul Conway was invited to deliver a keynote titled “Embedded intelligence to enable operational efficiencies in automotive manufacturing”. He illustrated a number of embedded intelligence projects are currently being implemented in the UK by manufacturers. One project enables real time asset tracking for returnable transit items (RTIs) via the use of RFID tags. Each RTI is assigned a unique identity and the data collected can be used to perform business and process analysis enabling improved supply chain visibility and process optimisation. Developments in RTI intelligence improve functionality, increase location accuracy, allow condition monitoring and reduced RTI losses. The keynote was followed by a presentation and Q&A session about our Centre for Doctoral Training given by our Deputy Director Dr Carmen Torres-Sanchez and PhD student Dimitris Pantazis. Next on the schedule was the University of Patras, where the team presented at the National Conference of Students of Electrical and Computer Engineering (Sfhmmy8). The conference is the annual conference of students of Electrical and Computer Engineering and has been conducted since 2007 in various cities of Greece. The goal of the three-day conference is to bring together students of all departments of Electrical Engineering, Computer Engineering and Informatics to learn about new technological developments and new labour market challenges. Heriot-Watt alumna Dr Suzanne Costello, who studied for both her Physics undergraduate degree and her Engineering doctorate at Heriot-Watt, has been elected Chair of the UK chapter of the International Microelectronics Assembly and Packaging Society (IMAPS); the first woman to hold the role. IMAPS is the largest Society dedicated to the advancement and growth of microelectronics, electronics packaging and related sectors. The Society has created a global network with more than 8,000 worldwide members; the United Kingdom Chapter of IMAPS was the first international Chapter and continues to maintain strong links with other European countries, the USA and Asia. Professor Tom Jackson, Director of Centre for Infomration Management at Loughbrough University, gave his inaugural lecture in February 2015 on ‘The Connected Jungle and the Digital Tree’. A recording of the lecture can be viewed on YouTube here. 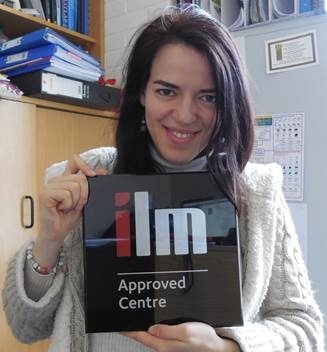 CDT-EI has formally been granted status of an ILM Approved centre. The Institute of Leadership and Management (ILM) is the largest management Awarding Organisation in the UK, and combines industry-leading qualifications and specialist member services. As an ILM Approved centre, our CDT offers students the opportunity to gain ILM Level 3 Certificate in Leadership and Management as part of the 4-year doctoral training programme. More information about the ILM can be found here and more details of our unique training programme "The Transition Zone" can be found here. CDT-EI staff and students attended the 9th and final conference of the Innovative Electronic Manufacturing Research Centre "IeMRC" at Loughborough University, UK. CDT-EI students were able to showcase their work by presenting posters during the breaks and networking sessions. 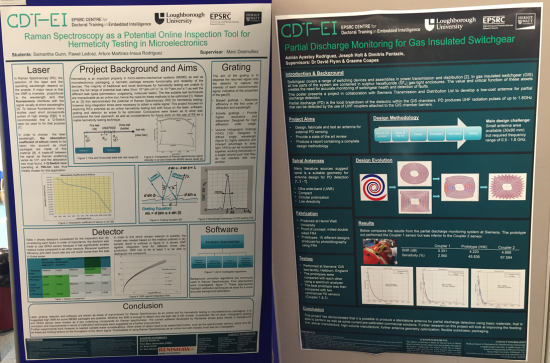 Below are images of the posters prepared about the group projects undertaken during semester 1 with Renishaw (left) and Siemens (right). More details about the work of the group and opportunities available can be obtained from Dr Richard Bibb at Loughborough University.